This post contains affiliate links. These links do not cost you anything however, they do give me a few pennies to help support the blog so I can continue to bring you great projects. Christmas is in full swing here at Vintage, Paint and more as I am sure it is at your home also. There are boxes of Christmas ornaments and decor scattered about, half finished areas done, in progress crafts and lots of fun with family putting it all together. So, finding something finished to bring to you this morning was a bit of a challenge. However, I think you will absolutely love this project as much as I do. A DIY Farmhouse Christmas Wreath made with a buffalo plaid deer head and a yarn wreath - rustic farmhouse to the max. This year I decided to add a bit of a rustic theme to my Farmhouse decor. I like to think it reflects a feeling of a quaint little farmhouse sitting by a still snow covered lake deep in the woods. With this thought, I decided to use all sorts of textures to create this cozy feel and today's project. This project uses two of my favorite winter textures - yarn and flannel. Combined, as I did here, they make the cutest Farmhouse Christmas Wreath for our mantel. This wreath is actually two separate projects put together to make a stunning wreath for your home. So, let's get started. First, you will need to make a yarn wreath. The one I have here I made a few years back and you can find the tutorial for it HERE. It's a simple project done by tying lots of yarn pompoms on a wire wreath form. I love the fullness and wintery feel of this wreath. You can actually make this with any yarn and in any color you like to fit your decor. This is not a hard project just a little time consuming. 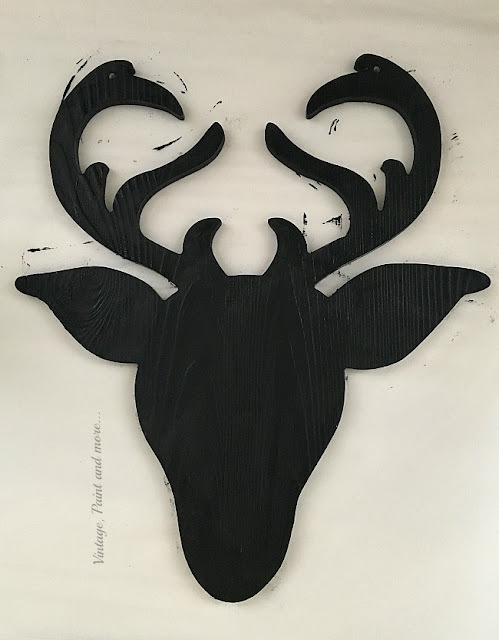 When you have finished this it's time to move on to making the deer head itself. I bought my wood deer head at Michael's in their Christmas section. They are sold out now but I am sure you can find one at any craft store near you. It is actually a sign and has a hanging string which you will need to cut off. You will use these holes to tie your head to the wreath later. I painted the head with black chalk paint front and sides so if my fabric pattern didn't fit perfectly it would not show. 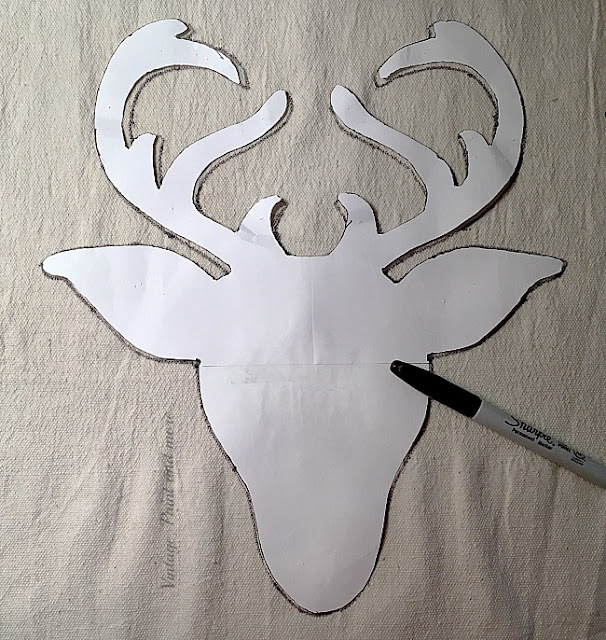 Next, I made a paper pattern of the deer head. I wanted to use the same pattern on a couple of other projects I plan on making this year. Also, I find the paper pattern can be pinned to the fabric and prevent moving while tracing. So, trace the pattern onto the fabric you are using and cut it out. Next decoupage the fabric onto the deer head making sure it's on straight. Use a credit card to smooth out any wrinkles that may occur while putting it on. 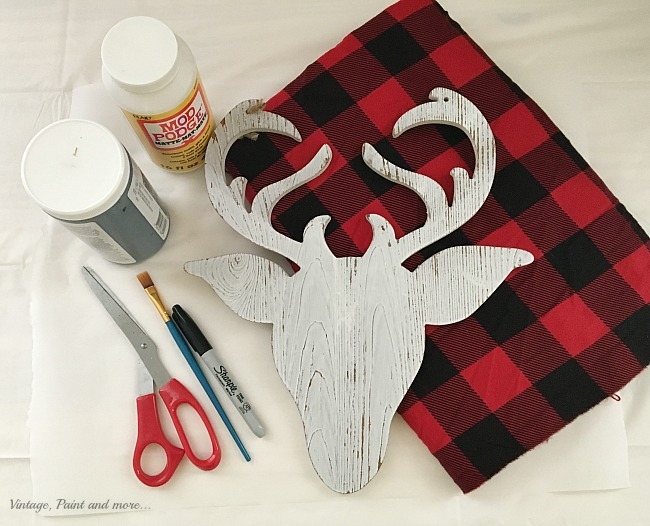 You only need to use the decoupage to adhere the flannel to the deer form. Do not decoupage over the fabric itself unless you want a shiny surface. I wanted mine to keep that wonderful texture flannel has. If it doesn't quite fit the edges don't worry - the black paint will hide any flaws. 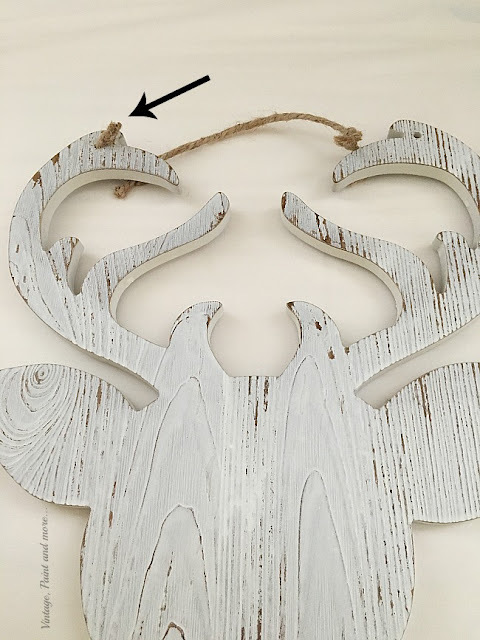 Now, just tie a piece of twine in the holes in the antlers and thread through the wreath to the wire form. Position the head where you want it and tie the ends of the twine to secure it. Mine is not very tight as it dug into the yarn too deep and I wanted it to look like it was sitting on top of the yarn. Now its time to hang it in that special spot. Ours is above our fireplace. I will be showing you the fireplace/mantel decor in a later post. I do love how it turned out - so rustic and full of texture. How's your Christmas decorating coming along - are you all done or just starting? Are you a theme decorator and change up your decor each year? I love to hear from you so tell me about it in the comments below. If you want to be sure you don't miss a thing here just sign up for my weekly newsletter in the box at the top so it can be delivered to your email. I will be linking up to the parties listed on the Where I Party page. Please be sure to visit and check out all the great projects and inspiration found at each one. Join our mailing list to get FREE crafts, diy and tutorials right in your inbox. 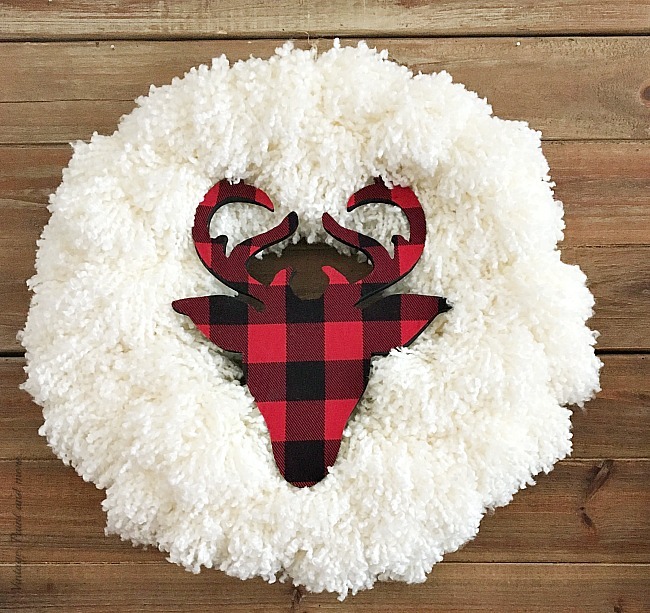 Love this!The buffalo plaid with the white wreath look really good together. Cute! 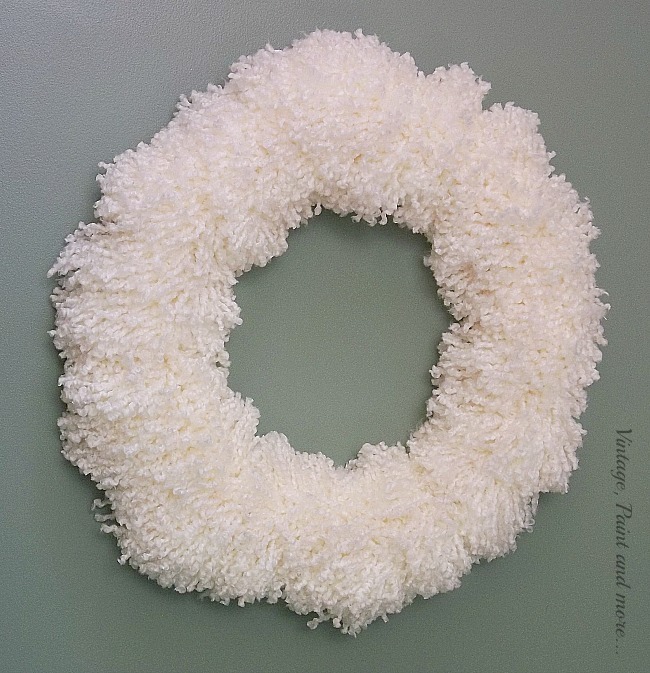 Love the pom pom wreath that you can reuse for all season. Visiting from Flaunt It Friday party. Thank you Victoria - this wreath would be perfect for most seasons and fits most decors. Thank you for stopping by. That is such a fun wreath! I love the texture from the yarn wreath with the pop of bold pattern in the plaid. Great job and thanks so much for sharing at the #happynowlinkup! Thank you so much, Leslie and thank you for hosting each week. Love this , such a great idea :) Thanks for sharing at Creative Mondays last week. You are one of this weeks features. I love this beautiful wreath and I am choosing it as my feature at Totally Terrific Tuesday. It will go live at 9 central time tonight. I hope you link up with us again! Thank you, Sherry and thank you for the feature and hosting each week. So cute, Cathy & I love the buffalo check! Thanks for sharing at Vintage Charm! Thank you, Cecilia - buffalo plaid stole my heart this year, lol... thank you for hosting such a great party each week. What a fun wreath! Thanks so much for sharing at our Party in Your PJs. Thank you, Amber and thank you for stopping by. Love that buffalo plaid with that yarn wreath. So nice! Thanks for sharing at our link party! 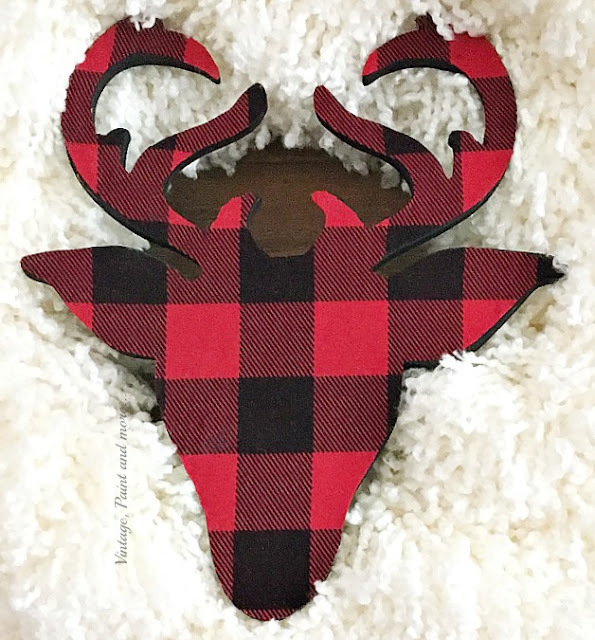 Buffalo plaid has certainly stole my heart this year - thank you for stopping by Stephanie and for hosting your party each week. Thank you so much Marilyn, for featuring my wreath - and for hosting such a great party each week. Thank you so much, Christina and thank you for hosting each week. So stinkin' cute! Featuring when my party opens up tonight. Thank you so much for the feature, Carol and hosting each week. That giant yarn has got me mesmerized, It looks so fluffy! And the deer in the center is so pretty with the buffalo check. Thank you, Mary - I'm so glad you like it. Thank you for stoppping by.